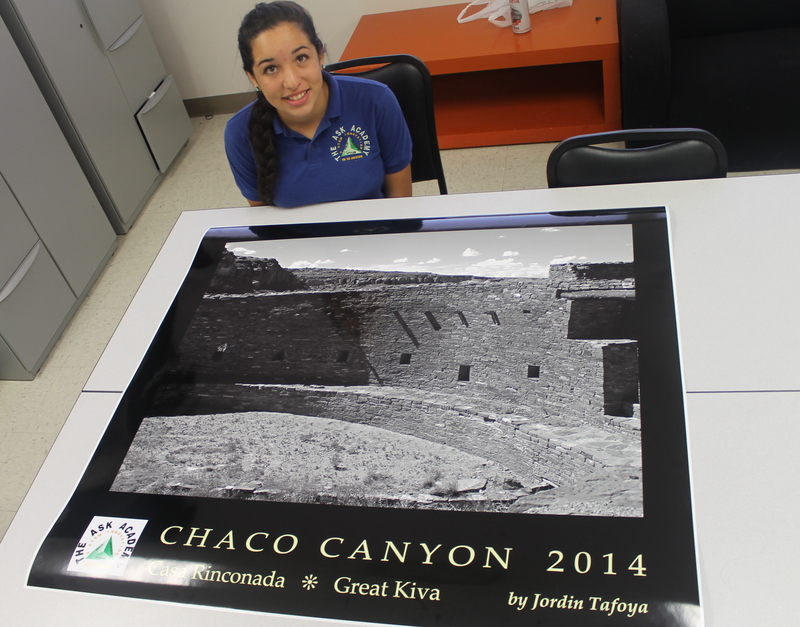 Instagram contest winner, Jordin Tafoya, with the poster of her photo from Chaco Canyon. — Sophomore Jordin Tafoya is the winner of the 2014 ASK Academy Chaco Canyon Instagram contest. Her black and white picture of one of the kivas in Casa Rinconada received 70 ‘likes’ on Instagram. There were 95 submissions in total for the Instagram contest, consisting of submissions from scholars, project managers, and other guests who were on the camping trip. Scholars were asked to vote by ‘liking’ their favorite photos. Tafoya was gifted with a poster of her photo, created by Project Manager Shelly Bethke’s husband, Richard Schneider. Schneider donated a poster to Jordin, and one to the academy, which can be found hanging in the upstairs lobby. To view all the Instagram submissions, search for #askacademycc2014 on Instagram.